Never underestimate the power of underwear! With no battle gear or armor to speak of besides his butterfly mask and skivvies, Papillon Mask survives a bitter duel against our boy Kazuki. Meanwhile, Papillon Mask's great-great-grandfather Dr. Butterfly promises him the true powers of a humanoid homunculus, which includes the ability to use a Buso Renkin. Will Kazuki and Tokiko be able to fend off their very powerful - and very eccentric - nemesis? 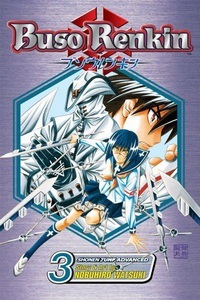 Story and art by Nobuhiro Watsuki.